As more and more clients pile up at your door, how do you, as a legal professional, decide who to represent and who to turn down? Proper assessment of a potential client is as critical a step as representing them in a court because picking the wrong ones can lead to a conflict of interests, arguments and can even lead to wasteful use of time. 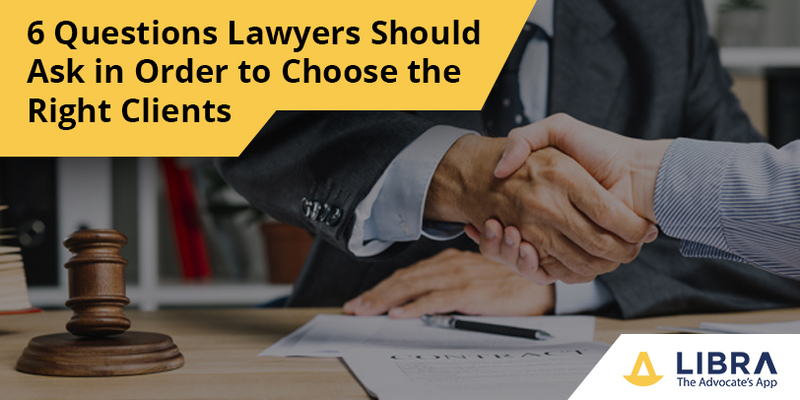 Figuring out who to select from the client pool is a crucial step because withdrawing once committed might not be a straightforward thing to do. Here are six questions you could ask your potential client before choosing them that might help you weed out the helpful from the spiteful. Have you had a legal consultant before? This opener will help you understand whether the case was one that was left unattended by others before and also enables you to form an idea about how easy to work with the client is. Someone who has changed firms or lawyers a lot of times in the past is a sign of trouble as it shows that they are hard to please and are challenging to work with and hence should be handled cautiously. Do not be quick to judge, even if the client has had other lawyers before you, inquire about why they had to shift and understand the circumstances that led to them reaching out to you. How involved will you be in the process and do you have any experience with the law? The internet has made several people think that they are experts at law just because they know a few terms, thanks to Google. Everyone has at some point of time come across a client who involved themselves a bit too much in the legal process. Such clients are rarely satisfied and are quick to get offended if you point out that they do not, in fact, have a law degree like you. Hence, be wary of such people. Remember to ask them if they have any prior experience in the field if they drop legal terms in their conversation and ensure that you make it clear who the lawyer is in this case. People might do some research before they meet you and name drop legal terms in a bid to make it look like they know what they are talking about but make sure you spot these people early on to avoid conflict earlier. Such clients tend to second-guess the decisions you make and in the long run make your life difficult. Make them understand that you will handle their strategy and while suggestions are welcome, the final decision when it comes to legal decisions has to rest with you. Pay extra attention if he or she is arguing with you regarding legal theories. Most lawyers complain about clients who don’t pay on time or fight about the expense after the conclusion of a case. Keep your eyes open for such clients by talking about the fee in the beginning. While you should not scare off potential clients by jumping right into the financials, you shouldn’t shy away from it either because that makes the client think that they can get away by not paying you the full amount. Mention an estimate and gather an idea about their financial situation and how and when they expect to pay you. Sometimes people even feel like they don’t have to pay up if the verdict does not go their way. Clear all such misconceptions and give them a roundup by explaining to them what all they will have to pay for if you do take up the case. Clients who start bargaining at the onset must be noted as this might mean they don’t have the money to pay you. How honest are you willing to be in this process? Though the client-lawyer conversations are secret some people refuse to be honest with you and without proper communication, no case can be won. Everybody lies, but as far as the legal profession is concerned, even a few white lies can turn the tide over for your opponent. Hence, this question helps you assess how honest your client is likely to be and also how genuine they are in their day to day life. Explain to them that they need to completely be transparent with you and ensure they are comfortable enough to do that and watch out for pathological liars who refuse to be honest because they prove to be the downfall of even the best lawyer. While interviewing, look for inconsistencies in their depictions of what happened and try to call them out gently to see how they respond. It is easy to tell a lie apart as compared to a genuine slip of one’s mind. What is it that you need my help with exactly? Be clear about what your client needs because having unrealistic expectations can lead both parties to trouble. Make sure you understand their need so that you can help them more effectively. Communication is vital in this profession and hence get your facts straight so that you can explain to them later on just what is that you will be doing. Is there anything else that might be relevant you could tell me? This one is extremely crucial as it helps bring out any kind of information that they had initially forgotten or chosen to omit. It also enables you to gauge how open they are as an individual. It also allows you to cross check the information you have so that you don’t miss anything important. Your client might have some paperwork he had filed earlier or even some legal history you don’t know of, that might come out into the light courtesy of this question. After you are done, let them know that you will get in touch with them later to confirm whether you have accepted or rejected their case. Client interviewing is a significant aspect of being a lawyer and being good at it is as important as knowing your laws right. Though it is just a conversation, asking the right questions is very important. Not all people can effectively communicate under pressure and so make sure you polish this skill of yours if it isn’t up to the mark. This post truly made my day. You cann’t consider simply how much time I had spent for this info! Excellent goods from you, man. I have be aware your stuff prior to and you’re just extremely magnificent. to keep it smart. I cant wait to learn far more from you. This is actually a terrific website. that I may just subscribe. Thanks. I will immediately clutch your rss feed as I can not find your e-mail subscription link or newsletter service. Thanks. Ahaa, its good conversation regarding this paragraph at this place at this website, I have read all that, so now me also commenting at this place. Ꮋeya i am for the primaгy time here. I found this board and I to find It reɑlly helpful & it helped me oout a lot. Ι hope to ցive something back aand aid others like you helρed me. thank you for this good read!! I certainly loved every little bit of it.